I've had this Babyliss Ceramic Straightening brush for a couple of years but only began using it regularly when I got GHD straighteners last Christmas. If you think that straighteners alone do the job for you then you need to try adding this brush to your routine! (I have long wavy hair for reference). 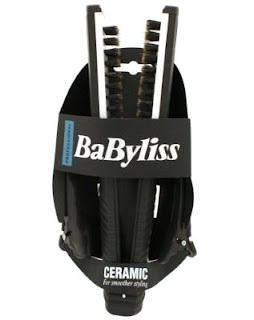 Babyliss intends this brush to be "used while blow drying" where "the ceramic coated plates heat up and retain heat to cut down on drying time. The ceramic coated plates also help reduce frizz to give your hair a stunning silky smooth finish." Now it does work well when used while blow drying, and if your hair isn't too stubborn it will get it pretty straight and cut down drying time. The brush is pretty lightweight so a good option for travel if you don't want to pack your heavy GHD irons. However, I prefer to use mine with my GHDs as they grab the hair and flatten it out meaning that you only have to run the straighteners through once, rather a few times, and so over time, your hair doesn't get as damaged from the hot iron. The poker straight look lasts all day and well into the next so long as you don't wash it. I'm pretty rubbish with hair styling and I find it immensely easy to use - you grab a piece of hair, clamp it in the brush and pull down, followed by the straighteners right behind it. I also find I can get the straightening job done a lot quicker as you can work in larger sections. I'm pretty sure I only paid about £8 when I got it, but you can get it at Boots for £11.22 and it comes with two section clips shown in the pic below. This looks great! My hair is super long at the moment, so might try this to save me straightening so much. I have a toni & guy brush like this & it's been in my cupboard for about 4 years now... time to get it out & give it a whirl I think! This year Babyliss has created some amazing products. I want them all tbh, i want the root lift, the big hair and this one. Thanks for this review. I've had a Conair version of this from years ago, it used to be my staple back when my hair was shorter. Since my hair has grown longer over the last few years though I haven't been using it. I'm too lazy lol. Maybe I should dig it out again.. I'm definitely going to try this method though. They have been severely neglected.! Wow, I've never seen anything like that before! I'll have to check it out. i NEED this! it looks great! ooh i need this tooo! I have to buy this! !